Herceg Novi is a coastal town in Montenegro located at the entrance to the Bay of Kotor and at the foot of Mount Orjen. 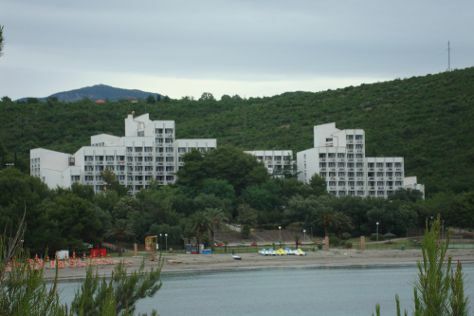 Explore hidden gems such as Plavi Horizonti Beach and Monastery Savina. Satisfy your inner culture vulture at Herceg- Novi Old Town and Forte Mare. Explore Herceg-Novi's surroundings by going to Tivat Municipality (Zbirka pomorskog nasljeda & Maritime Heritage Museum) and Perast (Palace Zmajevic & Perast Museum). Next up on the itinerary: stroll through Dobrec Beach, discover the deep blue sea with a scuba or snorkeling tour, and make a trip to Drinking fountain Karacha. To find maps, other places to visit, ratings, and tourist information, read our Herceg-Novi travel route planner. Sydney, Australia to Herceg-Novi is an approximately 31-hour flight. The time zone changes from Australian Eastern Standard Time (New South Wales) to Central European Time, which is usually a -9 hour difference. Traveling from Sydney in August, expect nights in Herceg-Novi to be a bit warmer, around 20°C, while days are much hotter, around 38°C. Finish up your sightseeing early on the 28th (Wed) so you can go by car to Budva. You'll enjoy a bit of beach vacationing at Kamenovo Beach and Milocher Park. Get a sense of the local culture at Saborni Hram Hristovog Vaskrsenja and St. Nikola Church. Explore Budva's surroundings by going to Kotor (Piazza of the arms, Photography Tours, & more), Moraca River (in Podgorica) and King Nicholas Museum (in Cetinje). There's still lots to do: contemplate in the serene atmosphere at Saint Ivan Church, contemplate the long history of Citadela Fortress, pause for some serene contemplation at Church of the Holy Trinity, and explore the ancient world of St. Tryphon Cathedral. To see maps and other tourist information, refer to the Budva travel planner . Traveling by car from Herceg-Novi to Budva takes 1.5 hours. Alternatively, you can take a bus. In August, daily temperatures in Budva can reach 38°C, while at night they dip to 20°C. On the 2nd (Mon), wrap the sightseeing up by early afternoon so you can travel back home.